Signs that business is booming in the Cape Fear region are everywhere you look these days – from the surge of hotels in downtown Wilmington’s burgeoning Convention District and storefronts popping up in midtown Wilmington to the continued growth of northern Pender and Brunswick counties and grocery stores, medical offices and eateries cropping up at all points in between. With a growing population comes an increasing demand for more commercial real estate but the lack of available land makes keeping pace with demand difficult. Even in the wake of roadway improvements and extension projects, more people are opting out of rush hour traffic in favor of mixed-use communities. We asked four local experts to share their thoughts on our area’s growing pains, as well as their take on our ever-evolving commercial real estate landscape and what the future may hold for the region. For the full PDF version, click here. What is the current state of the region’s commercial real estate market? MARK JOHNSON: A simple drive around town can answer this question. You don’t have to be an expert to see development taking place around our market. From pocket residential neighborhoods to large mixed-use developments, the Wilmington market is showing very strong signs. At Sound Bank, we are currently working on multiple projects, including commercial and residential investment properties, owner-occupied expansion projects and smaller residential multifamily properties. These requests are due to continued growth in our market, which ultimately is key to commercial development. KEN DULL: The commercial real estate market is as strong today as it was in the year leading up to the Great Recession. So, we’re looking at what we were experiencing back in 2007, except this time around, you’re dealing more with either end-users or professional developers, as opposed to speculators and amateur developers. It’s very robust. There is a lot of enthusiasm and confidence right now. GRAYSON POWELL: It is very strong. The market is still good; we’re just low on product. Our economy is strong, unemployment is at record lows, and demand for commercial space continues to grow. 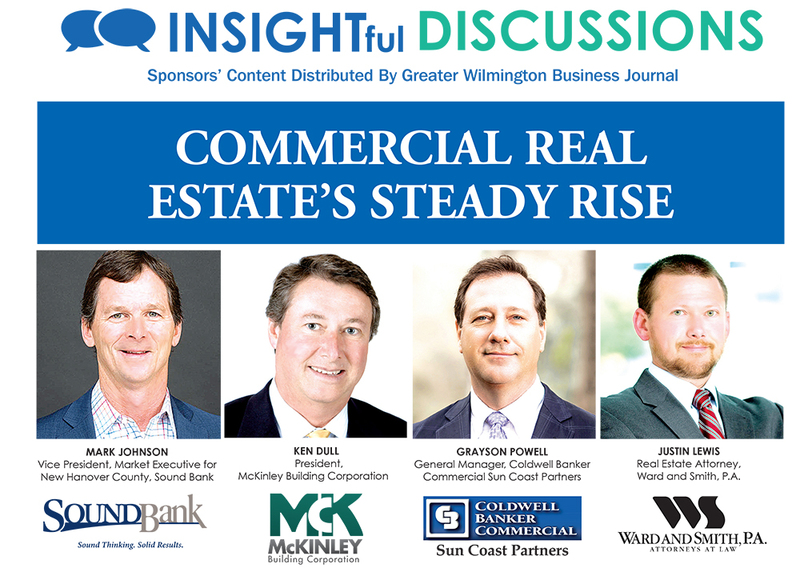 The lack of Class A office inventory is a familiar lament among commercial real estate agents in New Hanover County, and that will continue to be the case in the short-term. But the good news is that we have a lot of new projects on the horizon and pre-leasing is about to begin for a whole host of mixed-use projects, from Military Cutoff Road to midtown. These include Midtown Village and The Pointe at Barclay, in addition to the several new projects on Military Cutoff Road, including CenterPoint, The Avenue and Arboretum West. What major short-term and/or long-term impacts to commercial real estate do you anticipate from Hurricane Florence? DULL: By the first of the year, I think Hurricane Florence will be in our rearview mirror. It has probably cost us a month, and it’s going to be a drag in other areas of the economy, but with our ongoing projects right now, we’re moving full speed ahead. But I’d say that at about January 1, it will hopefully be in our rearview mirror completely. POWELL: Hurricane Florence has put a small hiccup into the works, but we are already rebounding from that pretty quickly. What kind of commercial development is currently most in demand? JUSTIN LEWIS: Industrial space and office space are in high demand. The construction of hotels and grocery stores continues at a steady pace. There are also a number of mixed-use projects underway or coming soon. JOHNSON: We are seeing a little bit of everything, but we have seen an increase in commercial and residential investment property requests for financing lately. DULL: From a building perspective, we’re working on projects in pretty much every sector right now. We’re working on office buildings. We’re working on medical facilities. We’re working on industrial facilities. We’re working on multifamily spaces. There seems to be kind of a broadness right now. There isn’t any one sector that seems any hotter than another sector. Everything is hot. POWELL: Definitely flex space and light industrial. Flex space is any space rented for less than a typical five- to 10-year lease and appeals to landlords and tenants because it does not constrain them to long-term lease agreements. Landlords like flex space because it often leases quicker and easier. Tenants like it because it reduces their rent exposure over the long-term. The greatest demand for flex space typically comes from small tech and start-up firms, but it is also very appealing to consulting firms, finance, media and real estate companies. And light industrial is a wide range of companies and is being particularly impacted by the growth of e-commerce. Distribution centers are popping up all over to accommodate the demand for rapid delivery of e-commerce purchases. To what do you attribute the continued appeal of mixed-use communities to buyers and/or tenants? DULL: I’ve spent six years on the city planning commission and six years on the county planning commission. Now, I’m an alderman for the Town of Wrightsville Beach. So, something I like to pay attention to is growth patterns and how you sustain quality growth without it choking you. Obviously, mixed-use planning came to the forefront in our area, when Mayfaire broke ground back around the early part of 2000. I think that’s a great example of where you can work, play and live. I see that even more so in bigger markets, like Raleigh and Charlotte. That live, work, play concept is something people really are pushing for – a place where they don’t even have to get in their car. I think millennials and retirees are really gravitating towards that. The days of the 5,000 square foot house in a subdivision 10 miles from town is not the direction I see us heading, which is a good thing for growth. POWELL: I think there is a lot of attraction to mixed-use properties, from a standpoint of having multiple uses on inner development, as in residential, retail and office. I don’t personally believe that there’s this real pent-up demand to have residential mixed with retail within the same building. I think there is some of that demand in very specific locations, like downtown, where people want to live the downtown life. There can be some real drawbacks to mixed-use within the same building, depending on the mix of uses. Residential over a bar scene, per se, can have some real drawbacks from the standpoint of noise and privacy. But I feel that people are trying to stay off the roads as much as possible. They don’t like dealing with the traffic. They don’t like fighting the thousands of traffic lights. So, if they can access businesses easier by living closer to them, they’re doing it, as with The Pointe and River Place. I think we’re still going to have some support for those kinds of development, and it depends on whether it’s done right or not. Honestly, that’s a big part of it. JOHNSON: If you have ever lived in a larger town or city, most of the neighborhoods are essentially a community within the community. That is to say, you do not have to go far to buy groceries, go out to eat, find good coffee, shop for clothes, find a pub, visit a park, or even go to work. In fact, many of these amenities are only a walk or bike ride away. We really do not have many areas like this, and developers certainly understand that these communities are desirable and are appealing to residents. Mixed-use communities provide many conveniences, as mentioned above, and, in essence, a sub-community where you could easily bump into neighbors while at the grocery store or shopping. I believe this trend is here to stay and will be dominant for new developments, while older areas will see transition towards this type of community over time. A mixed-use community typically consists of residential, retail and office components in close proximity. This is appealing to those who want to live in communities that have everything they need within walking distance. This form of development is appealing to retail tenants because of the steady stream of customers. Mixed-use developments can also reduce the stress on public infrastructure. We can expect to see this trend continue. How do you think the surge in new hotels and/or apartments impacts other commercial development? POWELL: Commercial always follows residential, so the growth of apartments certainly has an impact on commercial development to support the residents. Apartments allow more people to move into the community at more affordable rates and without incurring a huge financial risk. And, certainly, new hotels are a much-needed asset to support both business and leisure travelers. We know that people come here and just fall in love with the place. I mean, I’ve never seen so many people who just moved here without a job or anything other than they just love it here. That happens a lot in our market. LEWIS: The increase in the number of hotels and apartments should create a need for other commercial development, such as shopping centers, self-storage units, restaurants and other retail stores. The guests and tenants will create a higher demand for these other industries. DULL: This kind of plays right into the direction that we’re heading with retirees and millennials – that live, work, play idea, and the notion that people don’t have to own a property and can take that money and invest it in something else. I think we found out after the Great Recession that homeownership might not be your best place to invest. As far as the new hotels go, I think our area is still underserved. There is still a need, and I think studies will show that. Apartments and hotels are part of an immersive element and it only helps with that idea of live, work, play communities as we move forward. JOHNSON: Greatly, assuming the properties maintain high occupancy. A property, such as an apartment building or condominium complex, creates population density. The more individuals and families move to these multifamily properties or stay in the hotels in the area, the more demand there will be for services, such as restaurants, retail shops, service businesses, etc. As developers see the demand for these services, they will provide space to meet that demand. Conversely, if these properties have low occupancy, developers may wait for occupancy rates to turn prior to committing to future development. So, definitely, new hotels and apartments impact other commercial development. How can new development be balanced with a shortage of available land? LEWIS: Developers have to make the most of what is available. Mixed-use developments are an efficient use of land and allow for a combination of retail, commercial and residential all in one area. The condominium form of ownership is also a good way to make use of a small amount of land, because it allows for multiple owners in one building and provides vertical options. This creates more flexibility than the typical landlord-tenant form of ownership, since developers can sell portions of a project to different owners. DULL: When I was on the county planning commission, most of the development was all new development out in the suburbs. Then, when I worked on the city planning commission, that was mostly infill and redevelopment. The truth is, pretty much what’s going on within the city limits now is redevelopment. We just built a new retail center in front of [Westfield Shopping Town] that was formerly a bank, and the client tore it down and built a reuse of existing property. Hanover Shopping Center is another good example. That place has been there for 50 years and it has seen numerous recycles. Now, it’s kind of in its latest resurgence with the midtown area growing again. I think that’s a lot of the wave of the future, at least in this area, because we are limited to our footprint. We can’t just keep growing out, like Charlotte. We are restricted by the river and the ocean. So, I think that’s what you’re going to continue to see downtown and midtown and other areas of town, as well. POWELL: I’ve been talking about this for years. The question is – Do we want to keep this place the way we all remember it when we walked in the door, so to speak? I walked in the door in 1991, and it’s changed slightly since then! Height is always a hot topic in development, because a lot of people want to keep this a small town with smaller buildings and at a limited height. I realize you don’t want to go up to a skyscraper height or anything like that. But when you have limited land, which we obviously do, and a lot of that limited land is not even buildable, then you have to be able to go up to create more space without using up more land. Another solution is public transportation, so you don’t have to have parking lots for everybody to park when they go from one place to another. You have to have the public transportation in place, so that you don’t eat up that land with 10 parking spaces per thousand square feet of building. But right now, our public transportation is limited. If you take care of those couple of things – allow buildings to be taller and set up the public transportation, which the WMPO [Wilmington Urban Area Metropolitan Planning Organization] is really working hard to do, particularly with the rail system, I think that will be tremendous. That will help you get more production out of your land without using it all up. What are the major challenges to redeveloping property? JOHNSON: I think if you ask any developer, a few challenges will be top of mind: increasing real estate and construction costs; state and local regulations; permitting process; and labor. These challenges would apply to a new development or a redevelopment. POWELL: A lot of property here in town is nowhere close to within codes redevelop a property. It’s not that the codes we have are all bad; it’s just that to take a property and bring it up to the current energy standard, then bring it up to the current wind load standard and provide the parking that’s now required, as well as the access – all the laws that it takes to change a building from a 1925 building to a 2020 building is just quite a jump. The cost of doing all that is very prohibitive. Even new construction is becoming prohibitive. It’s becoming so expensive to build here. We’re trying to build safe, energy-efficient and accessible buildings, but there are so many layers of regulation that you have to get through. When you add it all up, it no longer makes economic sense. The customer always sets the price, right? So, you can make all of these improvements to these buildings, but potential buyers or renters may not be able to afford it. So, you’re constantly trying to find that middle ground, where the two can come together. DULL: I think that, as the city and the county work towards the [Unified Development Ordinance], they need to incentivize developers to redevelop. You should be able, for instance, to take the old Cinema 6 site on Oleander Drive and redevelop that without having to do new stormwater. You shouldn’t be punished for taking an eyesore and doing something good with it. There’s no downside to incentivizing those folks who want to turn those eyesores into repurposed properties. Those developers need more leeway than they are given. If somebody wants to redevelop, they are going to want to make it as nice as they can, but also affordable. LEWIS: Zoning and other use restrictions can create challenges. One of the main goals when redeveloping property is to make the new use fit the market and the surrounding area. There may be developers with a plan – and investors and/or financing in place to support that plan – but the property may not be currently zoned to allow for the proposed use. A developer will need to work with the appropriate municipality and planning/land use department to obtain the necessary modifications or rezoning. Are capital and credit options keeping pace with commercial development needs? POWELL: There is money available in most sectors, with probably the exception of apartments, right now. I think banks are a little leery of apartments and they may be a little bit leery of retail. DULL: Yes. I think right now the banks are back in business. And what I’m hearing from our clients is it’s more stringent than it used to be, which is good. There are more checks and balances. So again, it keeps the owner-occupied properties and the professional developers as the ones that are getting the money, not the amateur developers and speculators. JOHNSON: I feel like credit options are plentiful for developers. A good measure of this is the number of real estate projects under development in our market. These projects are being funded by either banks, conduits or private equity. I occasionally hear comments as to the number of banks in the Wilmington market. A developer certainly has multiple bank options in Wilmington and even more outside of this market. Although developers are always looking for the best rates and terms, I would be surprised to find many developers who would complain of the availability of credit options at this time. What challenges do environmental regulations play in developing our coastal area? LEWIS: Environmental regulations create challenges for most development in this region. Almost any new construction will be subject to erosion control measures and stormwater regulations, and many projects require CAMA [Coastal Area Management Act] development permits. Complying with these environmental regulations often increases the time and expense of a project. However, some of the features of our area that continue to attract people and businesses to this region are the beaches, waterways and surrounding natural environment, so protecting our environment while allowing for development is a balancing act we must continue to perform. POWELL: When you pay for an acre of land and then have a 500-foot setback from an estuary that’s parallel in your property line, you’ve lost 500 feet of use. So, your cost per acre has to be considered in the process. If an acre of land is 200 by 200 and you have a 500-foot setback, that acre is gone. There are good things and bad things about being on the coast. One is enjoying the natural setting and the ocean and everything that comes with that. Then, the other is dealing with it. Some rules have been pretty difficult to deal with and work around. Then, many times, you’ve got environmental problems with the quality of the soil. If you can work around a site that isn’t wetlands, then you’ve got to work with the problem that the soil is not going to support your building without putting in pilings. And that drives cost up. There are just massive amounts of issues that you have to be aware of when developing in this region. DULL: Environmental regulations have been fairly stable. There hasn’t been a lot of change in that. So, you know what to expect and developers can plan for those. I don’t think we need them to be any more stringent, though. It does get cumbersome – and it always has been that way – but as long as they stay like they are, I think we’re in a good place. Are there sufficient incentives available to support green building? DULL: There aren’t really any. Let me know if you know of any incentives. But in 2012, there was a new energy code that came into effect and basically, anything that has been built since then is a form of green building. We took a big step forward in 2012. LED lighting has changed the commercial building world considerably, as well as the more high-efficiency heating and cooling. Those two items, along with more insulation in buildings, really have changed things a lot. You have to do a cost/benefit analysis on green building to see if something is worth doing and when it will start to pay off. How would New Hanover County’s proposed Unified Development Ordinance benefit commercial development? LEWIS: The proposed Unified Development Ordinance could benefit commercial development in many ways. One such way is updated stormwater regulations. New stormwater regulations that take into consideration the current state of the environment and development in our region, account for the unique characteristics of redevelopment property, and are consistent with statewide rules could benefit commercial development by making the process more predictable and giving developers more options. POWELL: It would certainly simplify things if we had one set of rules to go by. The City of Wilmington comprises so much of New Hanover County, and with it being the smallest county in the state, it does seem like we could somehow come together and agree on a unified ordinance. Columbus County is a big county – the third largest county in the state. Brunswick County is the biggest county in the state. So, those counties having different areas, I can see. But New Hanover County is tiny from a land-mass standpoint. Now, I’m not saying that the land out in Castle Hayne is the same thing as the land on the Fifth and Market, but we should be able to come to consensus on zoning and building ordinances for our community. And the need to have a unified ordinance is only going to grow as our community grows. We’re anticipated to add 110,000 people over the next 20 years and up to 700,000 people in our general marketing area. We need to come to some sort of agreement on how we want future growth to be structured. DULL: What will be nice is that we’d have one ordinance for the whole county, so that no matter where we are in New Hanover County, we will know what the rules are. I’m a little disappointed that we haven’t been able to get it done more quickly. You can’t put a gate up on I-40 and tell people they can’t come, so let’s just plan appropriately. I’m afraid there are too many folks who think that, now that more people are here, let’s not allow any more development, and I just don’t think that’s the answer. Unfortunately, I think some of those folks are trying to push the direction of this code, and I don’t think that’s smart for anybody. I think you just have to plan accordingly for more people. JOHNSON: As our community grows, we have to ensure we are actively planning for the type of growth we want in our community. We only get one chance to do it right! One of the most important ways we can plan for the future is to ensure our development ordinance is modern, clear and concise. The New Hanover County Unified Development Ordinance project aims to do just that. When it concludes, the county will have a more modern set of regulatory tools to help achieve the goals in the county’s comprehensive plan. Ultimately, this is great for everyone concerned. Where there is development, by and large, residents in our area want good, high-quality growth. Developers typically like clearly defined guidelines so they know what the “rules” are. That the county is taking time to clearly define all of this will be a big win for everyone involved. What role do transportation and infrastructure updates play in supporting commercial growth? POWELL: There are many N.C. DOT [Department of Transportation] projects underway right now, and many more are coming. We can keep building roads and bridges to move people in cars. But at some point, our public transportation system has to play a much bigger role and it has to be developed in such a manner that people will want to use it. People laugh when I compare us to Manhattan but, in my mind, we’re like a Manhattan before it grew up. Growth is going to continue to come and it’s going to get more and more expensive to build parking decks to accommodate the vehicles. We need to identify better ways to accommodate the growth with public transportation. DULL: I think the WMPO has been doing a good job. I think there have been some changes made in Raleigh around 2013 that put more metrics into our planning for the future and how the money gets allocated, and I think that is starting to help us here in Wilmington. So, as someone on the WMPO told me recently, get ready for a lot of orange cones around here for a while. That’s growing pains but it’s a good thing. It just means they are trying to get ahead of problems that could happen, as much as possible. JOHNSON: As we all know, Wilmington is a wonderful place to live. We’ve experienced a tremendous amount of growth. From 2000 to 2010, New Hanover County’s population grew by roughly 26 percent and during that same period of time, the City of Wilmington grew by a staggering 40 percent. As our population grows, so does the need for commercial development. The availability of modern infrastructure is critical for all types of development. Historically, we’ve been behind the curve on these investments. However, it is clear that our local and regional leaders are working hard to ensure that we’re making the right investments to ensure we’re well positioned for the future. A great example is the investment the N.C. Department of Transportation is making in our area. Over $1 billion in roadway improvements are coming. The Military Cutoff Road extension, the northern portion of the Hampstead bypass and completion of the Wilmington outer loop are great examples of this. While we will need a bit of patience in the short term, the long-term gains will be beneficial for our community. LEWIS: Transportation and infrastructure updates are absolutely necessary to support commercial growth. Access is one of the many important factors that developers consider in the early stages of planning. As our population increases and our available land does not, our methods of transportation will need to evolve in order to continue to get people to and from work, home and other places in an efficient manner and our infrastructure must keep pace with the newest technological advances. Which portions of the Cape Fear Region do you anticipate will experience the most growth in the next few years? JOHNSON: It’s very clear that Wilmington is going to continue to experience growth for a long time to come. Historically, a significant amount of that growth has occurred in New Hanover County, specifically Wilmington. However, Wilmington is now at a point where very little undeveloped property remains. Within the corporate limits, real estate is very expensive and, for that reason, is beginning to inhibit growth. I believe growth in Wilmington will continue, but in a different way. Our community is beginning to transition from horizontal to high-density, vertical development. CenterPoint and The Avenue are great examples of the start of this trend. As development in Wilmington becomes more difficult, growth will begin to spill into the surrounding counties. We are already seeing this in Leland and Brunswick County. We will begin seeing it in Pender, as well. For years, Pender County’s growth has been slowed by the lack of public utilities. Now that municipal water and sewer are available there, it will begin to grow dramatically. LEWIS: Brunswick County towns, such as Leland, are growing at a fast pace and should continue to do so. As large residential communities, such as Brunswick Forest, continue to grow, the commercial development necessary to serve those growing communities will have to keep up. DULL: There’s no clear answer to that, but I do think that, obviously, the Mayfaire area is going to grow. There are two huge projects that are going to probably happen down that way. Midtown is, again, booming. I’d call midtown that swath from The Pointe up to Market Street via Independence Boulevard. Then, downtown is having a resurgence. Downtown is on fire. And I think Brunswick County is finally back on track. After the downturn, I think people thought Brunswick County would be dead for our lifetimes, but all those places that were dead are now starting to come back. People are coming, and they are coming fast right now – young and old. POWELL: Well, Porters Neck is going to explode, because it has already started. When I say Porters Neck, I mean all the way up to Scotts Hill. As you look at the sewer line extension that is trying to take place up in Scotts Hill and the Hampstead bypass plan coming, there is just so much opportunity up there. I think midtown is already showing that it’s going to be a big draw for business and retail. There’s a lot of opportunity there. I’m really most impressed with those two areas right now.